"If you're hearing this, I'm most likely dead." Life as a bounty hunter has its ups and downs. The ups come with bringing in a big score, while the downs come with the realization that you're risking your life daily just to earn a living. Certain tools make the work easier--tools such as active camouflage in Satellite Falling #1 from IDW Publishing. The issue is written by Steve Horton, illustrated by Stephen Thompson, colored by Lisa Jackson and lettered by Neil Uyetake. Satellite Falling #1 is more interested in introducing the reader to Lilly than anything else and with good reason. Horton presents her as someone who clearly has baggage, yet she doesn't let that stop her from doing her job as a bounty hunter--one of the few who can use holographic technology to mask her identity. It's a pretty clever device and Horton keeps it special by making Lilly one of the few who have the capability. And Horton relies on the combination of Lilly's personality and her technology as a catalyst for the story, in that by the end of the issue she's put in a tough spot because of both. And despite the issue really focusing on Lilly more than anything else, Horton still manages to pace the issue well and give the reader enough to keep their interest going forward. The artwork by Thompson is heavily science-fiction inspired and looks really good. All of his characters sport an otherworldliness to them that helps reinforce the notion to the reader that Satellite Falling takes place on a much different Earth than readers are used to. Lilly's camouflage changes her appearance to aliens who almost seem to lumber across the pages--a stark contrast to her otherwise unassuming appearances. Thompson manages to imbue each of the alien characters with plenty of expressive faces and emotions to bolster the notion that Lilly more or less lives amidst criminals. Jackson gives each character a bit more personality in terms of the coloring, in that most characters feature skin types that are darker and clothing that feels more vibrant. Satellite Falling #1 is a first issue that accomplishes what it sets out to do--introduce the reader to Lilly and her complicated life. She doesn't let the fact that most of her bounties are large, hideous aliens stop her from doing her job and doing it well. Horton's script is easy to read and effectively characters Lilly and those who populate her world. Thompson's illustrations are inventive and show an appreciation for filling out a science-fiction story with characters who are clearly science-fiction inspired. Satellite Falling #1 is a really strong first issue that hits the ground running and promises to make things difficult for Lilly. 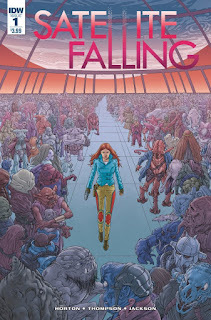 Satellite Falling #1 is in stores May 11.